What Are the Functions of Glass Slide & Cover Slips? 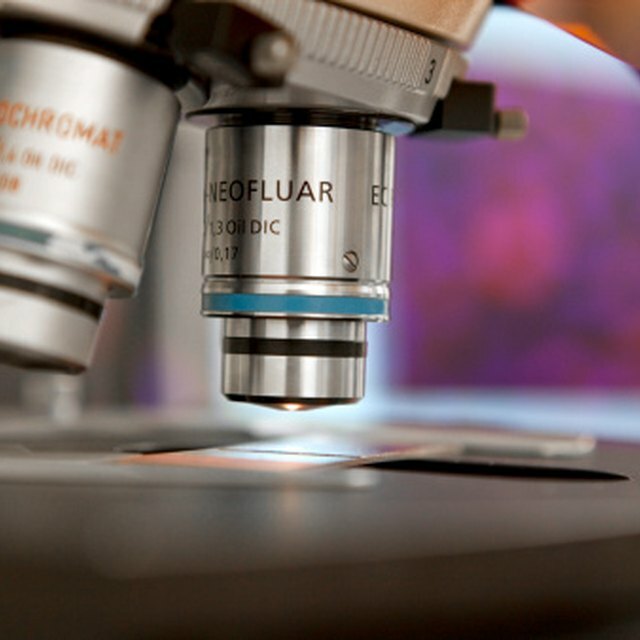 Microscopes enable scientists and students to study the cell structures of plant and animal organisms. The crystalline structure of minerals and the contents in a drop of pond water also can be observed. Microscope slides and cover slips are used to mount, or place, specimens in a way that is easier to handle and that protects them from cross-contamination. Microscope slides and cover slips "blanket" a specimen and secure it in place so scientists can view it with a microscope. A microscope slide is a long thin piece of glass that specimens are placed on for study under a microscope. It is easier to manipulate the slide, rather than the specimens, into the best position for viewing, as many are fragile and microscopic. Slides normally measure three inches by one inch and can be made of clear plastic in addition to glass. Some slides have small depressions to hold liquid for wet mounts. A wet mounted slide is one where liquid, usually a stain, is placed over the specimen. Stains help you see the organism better by highlighting the individual features. Cover slips are small squares of glass that cover the specimen placed on the microscope slide. They flatten the specimen for better viewing and also decrease the rate of evaporation from the sample, both in wet and dry mounted slides, explains the Newton website. If a stain or other liquid has been added, the cover slip keeps it on the specimen. Cover slips also protect the specimens from contamination by airborne particles or other substances. A prepared slide that is made up of a microscope slide, specimen and a cover slip not only gives the viewer better control over the specimen, but protects the microscope as well. The cover slip protects the ocular lens from damage by acting as a barrier between it and the specimen. The slide itself also helps to keep the stage, or the part of the microscope below the lens, clean. Wachman, Monica. "What Are the Functions of Glass Slide & Cover Slips?" Sciencing, https://sciencing.com/functions-glass-slide-cover-slips-6680506.html. 25 April 2018.